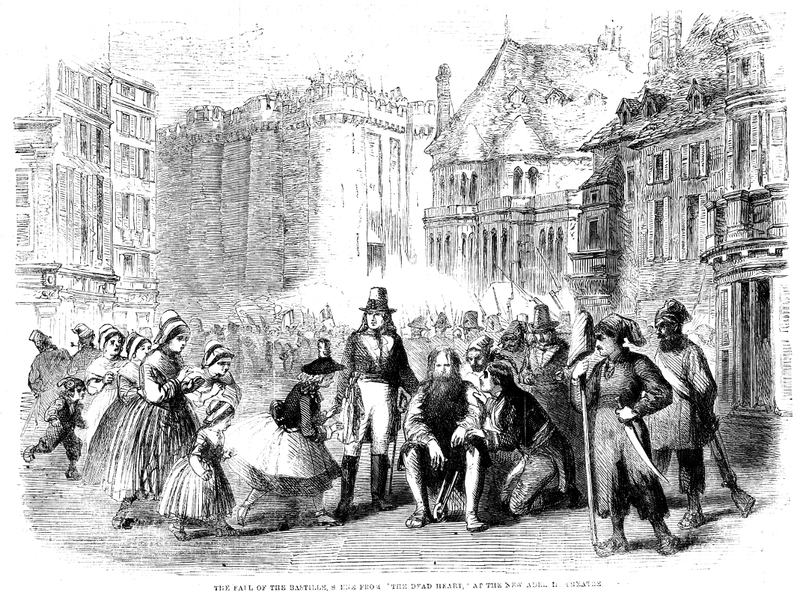 The Fall of the Bastille scene from The Dead Heart (Watts Phillips) at the New Adelphi Theatre. Robert Landry (center) was played by Ben Webster. The drama of "The Dead Heart" deservedly progresses in public esteem. The great scene of the destruction of the Bastille, and the deliverance of the lovelorn hero, now grown old in his despair and sorrow, has more than once been presented on the stage, but seldom in so complete, so picturesque, and so interesting a form. That a mise en scène so excellent in itself and so effective with the audience may be preserved, we this week give an illustration which will bring it again, in all its terrors and with all its pathos, before the reader. Even those who have not witnessed the drama, but, nevertheless, have read any adequate outline of the plot, will sympathise with the excited crowds in the moment of their victory and the assurance of their recovered liberty. With the affecting episode of the poor widowed lover set free from his long imprisonment, only to be tantalised with a fallacious hope, and to be resmitted on the heart with a blow more deadly than the first, the spectator will most assuredly feel with a degree of intensity that testifies to the power of the incident and the skilful selection of situation on the part of the able dramatist. We are disposed to place dramas of this kind in a higher class than that usually awarded to them. They are in the spirit of modern history; and with such events and their accessories, the drama of the future must necessarily deal. That, however, will place them on a more elevated stand point; bring to bear on them the philosophical and poetical mind; and seek to found on the life of the nineteenth century a series of dramatic chronicles which, shall remain as imperishable productions of tragic art. For this coming development, it would be well for theatrical managers to prepare.